A fast-growing consumer preference toward last-minute entertainment decisions has propelled Gametime to a banner year. Underscoring the emerging trend, 75% of tickets sold on the mobile app in 2016 occurred within seven days of the event. Year-over-year revenue growth exceeded 220 percent as the company expanded aggressively, catering to fans looking to live more spontaneously. As part of the expansion, Gametime has just launched over 1500 theater events in select markets, including San Francisco, New York, Boston, Chicago, and Los Angeles. 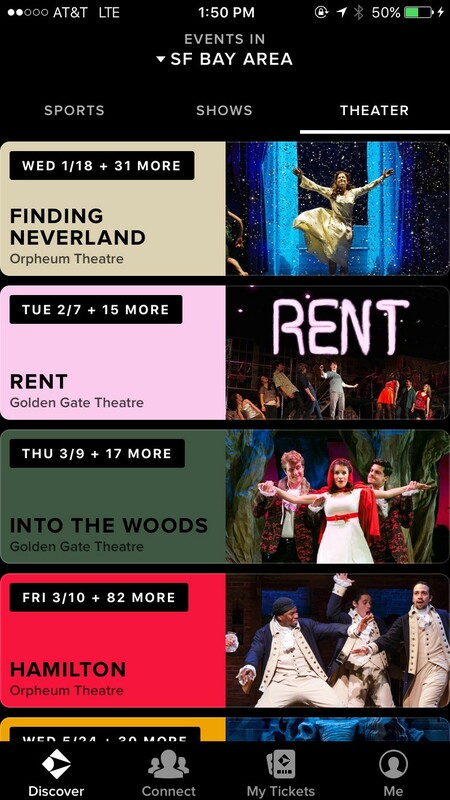 Gametime users now see a “Theater” tab displaying the popular upcoming musicals or plays in their city. Events such as the Nutcracker continue to be holiday favorites and the obsession for Hamilton has hit the West Coast as it prepares to open in San Francisco and Los Angeles in 2017. The Gametime Theater offering will expand to other markets throughout the U.S. and Canada in 2017. 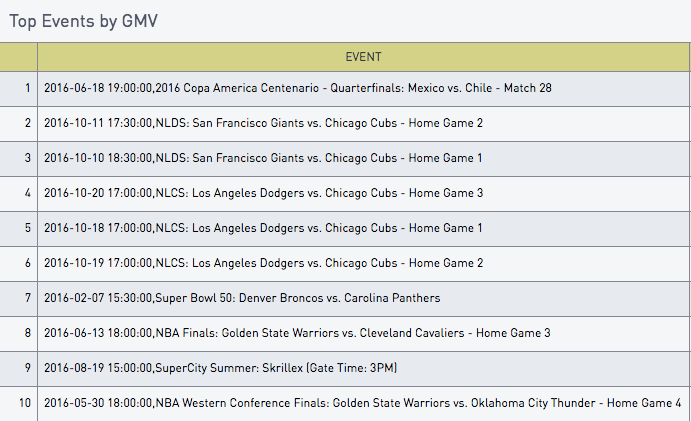 “We are extremely pleased with the progress we’ve made in 2016, but it’s just the beginning as we continue our mission to enable the easiest access to live events at the last minute,” said Gametime founder and CEO Brad Griffith. 2016 also showed impressive user growth with nearly two million fans downloading the app. Those last-minute fans, in particular, favored the continuously optimized mobile experience for on-demand and instant access to live events. Millennials, who make up nearly 80% of Gametime’s customer base, were particularly active on the app throughout the year. Baseball fans like Mark Hochberg, 27, found amazing last-minute deals, often after the start of the event, underscoring the promise of instant mobile access and inventory availability. Hochberg, a Chicago Cubs fan, used Gametime to purchase the very last ticket to Game 7 of the World Series, fifteen minutes after the game had started at roughly 50% off the average price of the day. Gametime established new company performance records throughout the year, most notably in Q4, when five of its top 10 grossing events in company history took place. In fact, over an eight-day span in October, the company scored its second through sixth best selling events ever, a combination of S.F. Giants and L.A. Dodgers postseason games. Some unique events helped drive the significant growth during the year including the 2016 Copa America Centenario — Quarterfinals in June, which became the company’s single highest grossing sports event ever and continues to hold that position. After introducing Music in December of 2015, the company added thousands of concerts across its various markets. While seeing significant sales around the hot tours like Kanye West, Drake and Beyonce, it was the SuperCity Summer Fest that ranked as Gametime’s single highest grossing music event in 2016. So high, that it qualified as the fourth highest grossing tour of the year. Headlined by DJ sensation Skrillex, the EDM stadium show is the only music event to rank in the company’s top 25 all-time grossing events. Gametime expanded its service footprint to 60 markets during the year bringing states like Alabama, South Carolina, and Nebraska onto the platform, all home to some of the country’s largest college football fan bases. In total, Gametime launched over 5000 events in 2016, more than ten times the number of events in 2015. Gametime continued to drive product innovation, introducing key features like its Snap & Sell and Connect. Snap & Sell enables fans to quickly take photos of any tickets they have and upload immediately to the Gametime marketplace. Connect introduced a prospective social network marketplace for fans to see what events their friends may be attending, where they are seated, and potentially join them by purchasing the nearest available seats. In June, the company began to define its brand of last-minute living by releasing its first video campaign, “It’s Gametime!”. The video, chronicling two friends’ crazy adventure getting to a game, was viewed over 4 million times on Facebook and liked nearly 7,000 times. 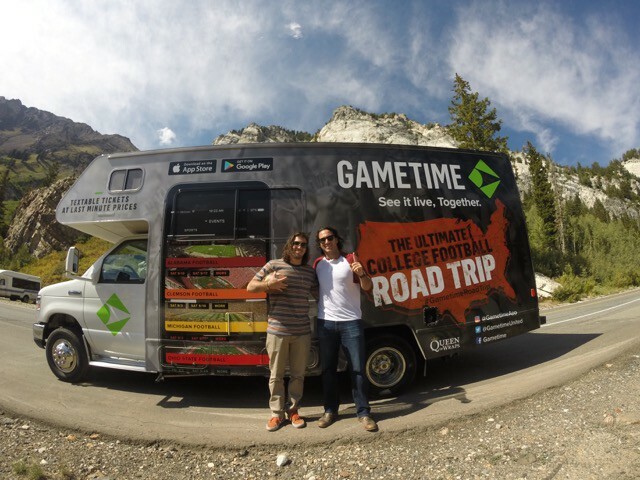 The Gametime College Road Trip served as another branding vehicle, literally, as Jameson and Mitch Ritter traversed the country in a Gametime-wrapped Winnebago attempting to establish a world record for most college football games attended in a single season. Currently at 49 games and counting, the Ritters have covered over 26,000 miles since Sept 1. The brothers have served as ambassadors throughout the journey, spreading the word on Gametime to fans and media. The duo expects to attend ten bowl games including the National Championship in Tampa. A $20 million Series B round of funding led by Evolution Media Partners and GV was announced in September, underscoring the confidence investors have in Gametime’s promise for the future. The new round brought total funding to date to $33 million, positioning Gametime well for its short road to profitability.